The Joybilee Farm Linen Festival is Saturday August 10th — 10am to 5pm. The Joybilee Farm Linen Festival is real and authentic, just like Boundary Country. You won’t find arcade games, loud music, and mustard slicked sidewalks. You won’t find plastic cartoon characters taller than a man. You won’t find piped music or pipe dreams either. And you won’t stand in a mile long lineup just to sit down. And I can promise you, your cell phone won’t ring, not even once. Life is slower here. We specialize in fresh, wind blown, green pastures, medal winning crystal fresh water, and authentic experiences — the kind that make happy childhoods, and profound memories. 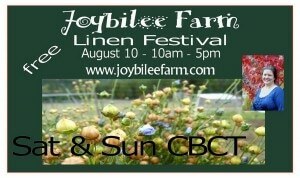 Come to the Joybilee Farm Linen Festival on August 10th and make some profound memories for your family. 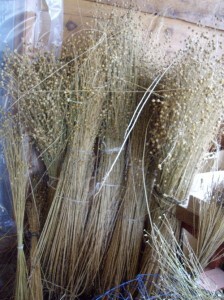 This is the 6th year of the Joybilee Farm Linen Festival, that takes place the second weekend in August each year, when the fiber flax field is ready to harvest. 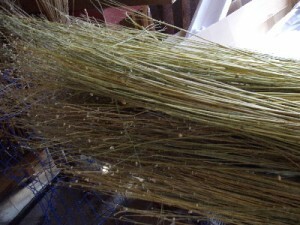 The Linen Festival is a celebration of the historical flax plant and the treasured fiber that comes from the stem. It is also a fiber arts festival focused on linen and bast fibres. Its an opportunity to visit with the animals — lambs, kids, and baby llamas. At last year’s Linen Festival our guests watched the birth of a brand new llama baby, called a cria. 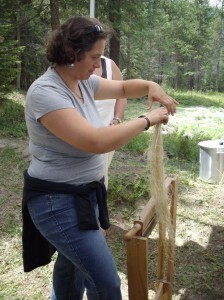 You’ll get to spend all day playing with this treasured fiber, and enjoy some hands on homestead learning. You’ll get a meaningful history lesson, and discover why this treasured fiber is in grave danger of extinction. And you’ll get to see real linen textiles from the Joybilee Farm collection and a few treasured pieces from the Boundary Museum, in Grand Forks. You’ll want to bring your family, too. Children are welcome to visit our sheep and goats throughout the day. We are a working farm though, so children must be supervised to keep them safe while on the farm. We’ve had visitors come to the Linen Festival from Israel, Japan, Germany, California, Oregon, Washington, Ireland, UK, France, Norway, Alberta, Ontario, Manitoba, Quebec, and New Brunswick. Even though admission is free, its a priceless experience to spend a day at Joybilee Farm, creating memories, and mastering the lost arts of spinning, weaving, and working with linen. Get some hands-on homestead know-how at Joybilee Farm’s Linen Festival. 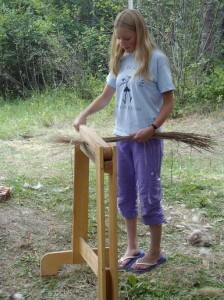 Does your guild or community have a linen project or a fibershed project? Can’t make it in person? Create a video and send it on a DVD and we’ll give it a showplace at the festival. (free to guilds and community groups). Bring a tent or RV. Camping accommodation is available in the Community camp ground in Greenwood, just 10 minutes to the West of Joybilee Farm. There’s also several motels and B & Bs in Greenwood and in the resort communities of Jewel Lake, and Christina Lake. Grand Forks is just 20 minutes East of us. Coming from the USA, we’re just 2 hours North of Spokane WA, plus a 30 minute drive once you cross the international border. Are you an artist or an author specializing in Linen or local fiber? Take a booth space to sell your works. Send me an email for more information. (reasonable rates). Want to spend the day at the Farm as a volunteer? We’ll provide lunch and we’ll make sure you build some awesome memories as you help others learn more about Linen and Flax. Our volunteers help at the various hands on learning stations, keep the coffee pot filled, watch that little kids stay safe around the animals, and enjoy the workshop at the end of the day. Simultaneously with the Joybilee Farm Linen Festival is the Columbia Basin Culture Tour. Joybilee Farm is one of the stops on the CBCT Tour, so when you travel to Joybilee Farm for the Linen Festival, you’ll have over 100 other artisan studios to visit, to inspire your creativity, and fill your home with treasured material culture. Why not plan your vacation around this awesome, one of a kind, authentic weekend away? Can’t make it to the Linen Festival? Get the DVD and experience the Linen Festival by watching on your computer. DVD’s can be preordered for delivery September 20th. Cost is $27. plus Shipping. 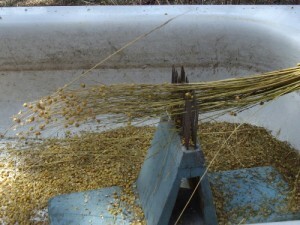 Hands on demonstrations of each of the steps of flax production from seeding the field to harvesting the flax, rippling, retting, scutching, hackling, spinning, processing the finished yarn, and weaving. Join in the Lost Arts Mastery Group in September and benefit from an intensive month of focused work with this treasured fiber. Lost Arts Mastery focuses on one traditional skill each month and group members benefit from weekly teaching videos, audio teaching, and interaction in an intensive focused group. Mastery is increased as you focus on one aspect of the Lost Arts each month, as we learn from each other’s experiences. This group process intensifies the learning, enabling you to move from beginner to mastery in a very short time. Group calls help you work out any struggles that you are having to master the Lost Arts of the month. More about this coming soon.